In the next bay south east of Tulamben, is a dive site that from the surface gives little hint of the richness that lies below. Seraya Secrets is what has become known as a 'muck' dive - that is a dive site without major coral formations, but lots of sand and small structures. 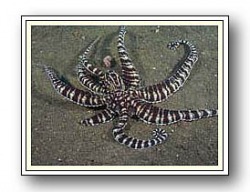 A site where unusual animals are abundant and easily located. Lying directly in front of Scuba Seraya Resort, Seraya Secrets has two distinct habitats. Just in from the black-sand beach the bottom drops steadily to a depth of around 3-9 metres, ‘Top Secrets’ is this shallower reef-top. Comprised of smaller rocks with patches of black sand, occasional sponges and tiny hard corals. This is the place to find Frogfish, Eels, Scorpion fish, Lionfish, Sea Moth's and Harlequin Shrimps. ’Deep Secrets’ is on the sloping bottom from 10 metres down to 35 metres. Small outcrops support micro-habitats where seahorses, cuttlefish, mimic octopus, striped catfish, nudibranchs, multi coloured crinoids and larger frogfish are found. All this in visibility around 10-15 metres and who said muck!